Stepping up onto Foodlink’s Curbside Market, a mobile farmers market parked at DePaul’s Ridgeview Commons Treatment Apartment Program (TAP) in Rochester, New York, Kristine E. passed on by the local farm-fresh eggs and headed for the fresh fruits and vegetables. Six peaches, four squash, four tomatoes for her father and a pint of cherries with the fruit destined to join bananas back in Kristine’s kitchen for a fruit salad. “It’s really helpful because I can get my stuff here instead of going to the grocery store,” she said, adding that DePaul’s Recreation Program offers trips to the Rochester Public Market once a month. Eating healthier is now also easier for Kristine E., a resident of Ridgeview. Thanks to a partnership with Foodlink, residents at Ridgeview are learning about nutrition through Foodlink’s Cooking Matters classes and weekly visits from the Curbside Market which brings affordable, easy access to fresh fruits and vegetables right to residents’ doorsteps. Foodlink’s Cooking Matters classes have been offered at Ridgeview Commons since March. So far, 18 residents have graduated from the program. Courses include hands-on cooking, basic nutrition and budgeting skills, interactive grocery store tours and recipes, videos and other educational tools, including a cookbook which participants take home upon completion of the course. According to the national survey “It’s Dinnertime: A Report on Low-Income Families’ Efforts to Plan, Shop for, and Cook Healthy Meals” found that 85 percent of low-income families prepare meals at home for five nights of the week, but only about half are able to make healthy meals on a regular basis. “I wanted our residents to experience and learn ways to cook healthy on a fixed budget,” said Ridgeview Commons TAP Assistant Supervisor Juanita Prince. Foodlink’s Cooking Matters classes have been offered at Ridgeview Commons since March. So far, 18 residents have graduated from the program. Whole grains and how to incorporate more fiber into a diet on a food stamp budget was the topic of discussion in a mid-July class. Nutrition educator volunteers from Foodlink explained that fruits and vegetables such as bananas, apples, pears, nuts and beans and whole grains are all good sources of fiber. Several residents questioned whether or not canned vegetables were a good source of fiber. “They are still a source of fiber, but higher in sodium, which makes it important to rinse canned vegetables before consuming,” said Nutrition Educator volunteer Mary George. Canned fruits can also be a good source of nutrition, though they should be packed in their own juices or water, George added. Cooking Matters courses include hands-on cooking, basic nutrition and budgeting skills, interactive grocery store tours and recipes, videos and other educational tools, including a cookbook filled with all the information reviewed in the class which participants take home upon completion of the course. After a discussion, residents headed into the training kitchen at Ridgeview Commons to put the information they learned into practice whipping up Northwest Apple Salad and Pineapple Carrot Muffins. Victor W. grated the carrots, with skin on for additional fiber, while Cat R. measures out crushed pineapple from a can into two bowls. 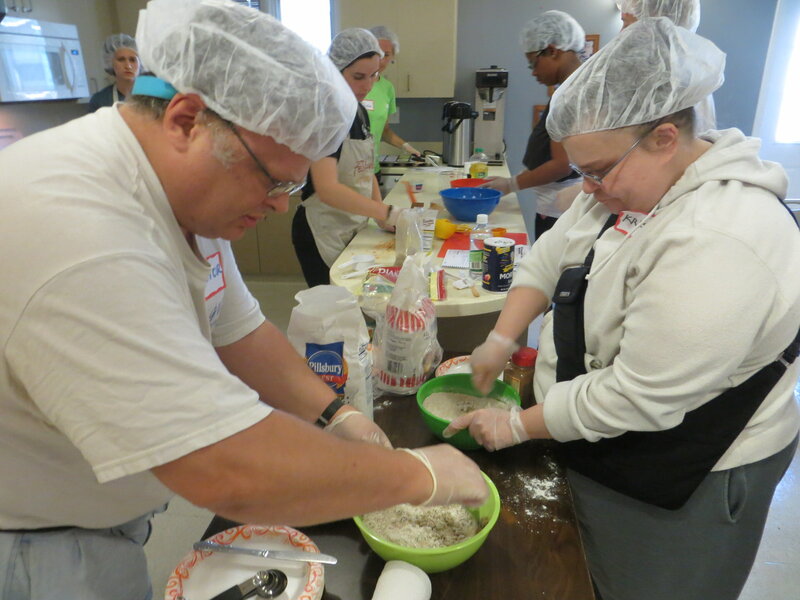 While the wet and dry ingredients are combined, Ridgeview residents discuss the difference between using baking soda to make their cupcakes rise versus using yeast to cause dough to rise, which they witnessed last week when making pizza. After the cupcakes had cooled, residents snacked on the foods they had cooked in the class while discussing the importance of eating a rainbow to ensure healthy hearts, body and mind, from red tomatoes and apples to white and brown potatoes, onions, turnips and mushrooms. Class participant Cat R. said fish is one of her favorite things to cook. She signed up for the Cooking Matters courses because she wanted to learn how to better season her food. The hardest part of cooking, she said, is finding the time. Every Thursday, residents are able to shop for fresh locally harvested, affordable fruits, vegetables and other perishables at Foodlink’s Curbside Market. Produce is sold at wholesale prices and customers can use SNAP, WIC and Fresh Connect benefits. “The hope is to make food distribution more equitable so that everyone can have access to fresh and healthy food,” said Mitch Gruber, Food Access Programs Manager with Foodlink. The Curbside Market offers a wireless EBT machine, accepts Farmer’s Market Nutrition Promotion checks and Fresh Connect Checks, which provides a $2 check for anyone spending over $5 on their SNAP benefits for fresh fruits and vegetables. Cash, debt and credit card are also accepted. On a recent Thursday, Ridgeview Commons resident John F. bought cherries, romaine and a couple of tomatoes from the Curbside Market. “I was hoping they’d have radishes, green peppers and onions for a salad, but they said they’ll be here next week,” he said with anticipation.